A scene from “Matilda” at the Civic Theatre. “Sometimes you have to be a little bit naughty,” sings the precocious, bookish five-year-old. At first, Matilda seems too good (and smart) to be true. But she is an inveterate prankster, who acts out against her neglecting, narcissistic parents (bleaching her father’s hair and gluing his hat to his head, for example). Once she realizes that she has telekinetic abilities (she can make a lot happen just by focusing her eyes), she starts to use her superpower against her monstrous school headmistress, Miss Trunchbull, to rather delicious effect, at the same time, liberating her treasured teacher, Miss Honey. There’s a dark undercurrent to “Roald Dahl’s Matilda, The Musical,” as there in in almost everything written by the beloved novelist, poet and screenwriter (1916-1990), whose 1988 children’s book provided the source material for playwright Dennis Kelly and comedian/musician/composer Tim Minchin, who created the music and lyrics. Some of Dahl’s works have been sugar-coated for a Disney-fied young audience (“Charlie and the Chocolate Factory,” “Fantastic Mr. Fox”). But the nasty, quirky tone was maintained in the delightful 1996 film, with Danny DeVito directing and, along with his wife, Rhea Pearlman, playing Matilda’s selfish, scheming, fiercely anti-intellectual parental units. The musical, which won a record seven 2012 Olivier Awards (including Best Musical) in London, where it premiered, also snagged four Tony Awards on Broadway, including Best Book of a Musical, Best Scenic Design and Best Lighting Design. This touring production, superbly directed by Tony winner Matthew Warchus, features a large and excellent cast executing electrifying, precision drill-team choreography by Peter Darling. The sets and costumes (by Tony-winner Rob Howell) are whimsical and the lighting effects (Hugh Vanstone) are spectacular. The 12-piece orchestra (with seven local musicians) is dynamic. But the entire undertaking is undermined by the atrocious sound/acoustics in the Civic Theatre. I was seated in the mid-orchestra, and those around me were complaining (as were we) that they couldn’t understand a word of the lyrics. And that’s a pity, because the lines and rhymes are often witty and unpredictable. Tiny Jenna Weir (one of three alternating Matildas) is superb, with a strong voice, captivating stage presence, sharp moves and articulatory precision. Continuing the tradition of a man playing Trunchbull, Dan Chameroy (though his hair and costume don’t make him look particularly womanly) is funny and forceful. Jennifer Bowles (Miss Honey) has a stunning voice, Darcy Stewart (Mrs. Wormwood, Matilda’s mother) dances with pizzazz. 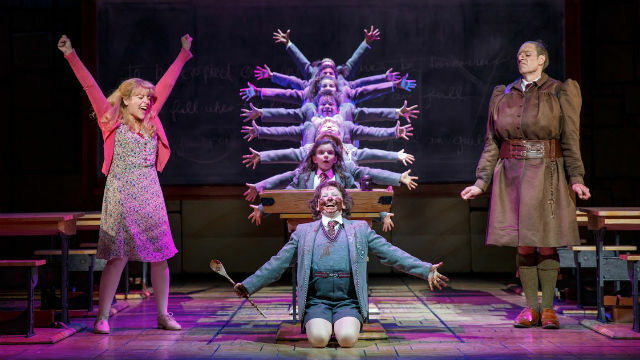 And there’s a local connection to Mr. Wormwood; hilariously over-the-top, plaid-clad Matt Harrington, who also played the role on Broadway, is the son of Rhoda Auer, an avid arts patron and supporter, former coordinator of the English Speaking Union chapter of San Diego. There’s so much energy and talent on the stage, and so many lessons about literacy and female empowerment, combating menace and defending what’s right and fair (the last, particularly pertinent these days), that missing any of it is a tragedy and a venue travesty. Performances are Friday-Saturday at 7:30 p.m., Sunday at 6:30 p.m., matinees Saturday at 2 p.m. and Sunday at 1 p.m.